Structured process, integrated into every-day tools, and bottom-line focus are the key words for successful and efficient implementation of management frameworks. 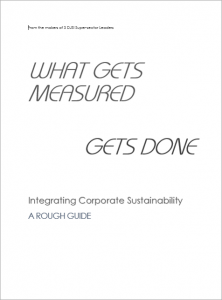 What is true for management in general equally applies to bottom-line integration of sustainability. Vision: first and above all, there needs to be a vision in the house. Preferably a vison based on where you come from. It helps if that vision is clear to start with, but that is not the ultimate requirement for successful implementing sustainability. Integration: “Sustainability” is not an additional or separate issue; it’s the core of every successful strategy. Success is based on logic. Integrated, analytical logic. And, last but not least: “common sense” is the mother of it all.